But as the US stretches its military and financial forces thin in the course of expanding its empire across the world, the collapse of that empire looms and, with it, increasingly jittery feet from countries desiring to make prudent financial decisions. For countries tired of being victims of the empire, those who desire a “multipolar” world, and those seeking to expand their own empires, however, the smell of blood is wafting through the air. China, the emerging and competing empire, has already started the process of dumping the American dollar in a careful and coordinated fashion. This is particularly concerning since China holds so much of America’s debt and so many US dollars. If China dumped all of its holdings at once, America would likely enter a new financial crisis. Fortunately for Americans, however, such an immediate move would also throw China into a crisis which is most likely the main thing holding China back. But make no mistake. China is moving forward with the plan of relieving itself of the dollar. After all, the country recently inked a deal to trade oil in yuan instead of the dollar. “Mainland it is laying the ground for the Belt and Road Initiative, and China is even sweetening the pot by offering swap facilities to local countries to promote the use of the yuan,” Stephen Innes, Head of FX Trading for OANDA in Asia Pacific told RT. Indeed, it appears that developing country-to-country trading mechanisms are emerging as well which will eventually subvert the US dollar as the world reserve currency. Interestingly enough, the development of such a system is a result of aggressive Americans sanctions and financial bullying over the past few decades. The United States maintains sanctions on all of its target nations such as Iran, Syria, North Korea, Russia, and others. But the US also threatens its “allies” with sanctions if they dare act rationally on the world stage or refuse to follow American dictates. As a result, America is sanctioning itself into isolation and creating a world where it has taken its ball and gone home so many times that the rest of the kids realize it’s possible and even easier to just play the game without the American bully on the field. Still the biggest foreign holder of the US foreign debt, China slashed it’s share by nearly $14 billion, with the country’s holdings falling to $1.15 trillion from nearly $1.17 trillion in August, according to the latest data from the Treasury Department. The fall marks the fourth straight month of declines. China is followed by Japan, whose share of US Treasuries fell to $1.03 trillion, the lowest since October 2011. Washington has accelerated the Treasury issuance to avoid potential growth in the federal deficit due to the massive tax cut pushed by President Donald Trump, as well the federal spending deal approved by the government in February. Chinese purchases of US state debt have been decreasing over recent months. The latest drop comes on top of the escalating trade conflict between Beijing and Washington over trade imbalance, market access, and alleged stealing of US technology secrets by Chinese corporations. So far, the US has imposed tariffs on $200 billion of Chinese goods and Beijing retaliated with tariffs on $60 billion of US goods and stopped buying American crude. China and Japan – the two main holders of the US Treasury securities – have trimmed their ownership of notes and bonds in August, according to the latest figures from the US Treasury Department, released on Tuesday. China’s holdings of US sovereign debt dropped to $1.165 trillion in August, from $1.171 trillion in July, marking the third consecutive month of declines as the world’s second-largest economy bolsters its national currency amid trade tensions with the US. China remains the biggest foreign holder of US Treasuries, followed by long-time US ally Japan. Turkey is also backing away from the dollar, having dropped out of the “top-30 list of holders of American debt.” This probably has more to do with Turkey finally coming to the realization that the US was engaging in “hamburger diplomacy” and has no real allegiance to Turkey accept as a vassal state. The failed military coup in the country and the US arming of Kurdish forces in Syria have done nothing but push Turkey toward Russia. India remains in the top 30 holder list but it has cut its holdings for five straight months. One of Russia’s largest banks, VTB is seeking to decrease the share of US dollar transactions at home as locals are choosing the Russian ruble over the greenback. “There is one interesting thing I wanted to highlight. Since the beginning of this year, people seem to be less interested in making dollar deposits or taking out dollar loans, compared to ruble-denominated deposits and loans. We believe this to be an important step towards the de-dollarization of the Russian finance sector,” said VTB head Andrey Kostin at a Kremlin meeting with President Vladimir Putin. According to Kostin, VTB experts have drafted a package of proposals designed to further promote the ruble in international settlements. “I think that we need to create our own financial tools. This would serve as an additional safeguard for the Russian financial sector against external shocks, and would give a new impetus to its development,” Kostin added. The financial tools Kostin mentioned are floating Eurobonds, shares and other derivatives that are now used only in the West. Russia has been seeking the ways of decreasing the dependence on the US currency after Washington and its allies imposed sanctions against Moscow in 2014. In May, President Putin said Russia can no longer trust the US dollar-dominated financial system since America is imposing unilateral sanctions and violates World Trade Organization (WTO) rules. Putin added that the dollar monopoly is unsafe and dangerous for the global economy. It is important to remember that Russia has also dumped $47bn worth of Treasury bonds, dumping nearly half of its holdings at once. What Happens If The Dollar Loses Its Status? So why is this concerning? 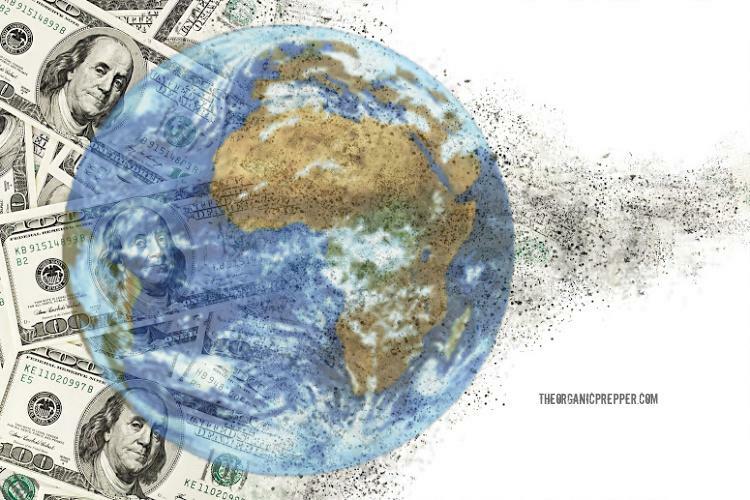 What would happen if the dollar loses its status as the world’s reserve currency? Despite mainstream claims, we’ve never really been in this specific situation before. Other countries have seen their currency used as the de facto world reserve but, when their time was up, there were also many other factors at play and the world financial system was less intertwined than it is today. Still, although we may not know the specifics, we do have a general idea of what would happen. First, Americans are going to lose the convenience of being able to use their currency just about anywhere in the world, both on a business and individual level. That’s not such a big deal on the individual level though it may cause a few hiccups for mid-sized businesses. Second, interest rates will most assuredly go up. This is going to make it harder for businesses and individuals to pay back any loans they may have received to start or maintain their businesses, buy a home or car, and it will stifle economic growth and it is going to make more people hesitate to request those loans knowing that interest rates will be so high. Third, and perhaps the most dangerous, is the potential for widespread inflation and devaluing of the currency. Loss of world reserve status will undoubtedly lower the value of the dollar. The question, however, is whether that devaluation would occur slowly over a period of years or even decades or whether it would take place within months, weeks, or days. Obviously, the former would be preferable if the dollar does have to be unseated because it would at least allow time for Americans to brace themselves and to prepare and innovate for the coming devaluation that would gradually get worse. In some cases, American exports might even be helpful for some American exports (though not helpful in terms of wages – competing via lower living standards is a race to abject poverty). But at least a slow burn would allow for Americans “in the know” to stock up on food, attempt to pay off their debts, arm themselves, and make prudent financial decisions in anticipation. The next wave is likely to involve a worldwide dollar panic. Using ballpark figures, we can say that there are about $4 to $5 trillion sloshing around the world in the form of hot money, US Treasury securities, Euro dollars, and various forms of zeno-dollars. Japan has about a trillion, China almost $2 trillion, and so forth. It is naturally very unwise for a developing country like China to hold so many dollars rather than using them to purchase needed infrastructure and capital goods, and the Chinese leaders are now very uncomfortable with their own foolish decision, which was of course taken under heavy US pressure. But the point is that this $4.5 trillion overhang is by its very nature exceedingly unstable. Every country that holds large sums of dollars or US treasury bonds is nervously eyeing every other such country to see if they show signs of bolting for the exit. Up to now, so far as we know, no large holder of dollars has attempted to reduce its exposure to the battered greenback by dumping these dollars on the international market. If anyone did so, would cause a true universal financial panic which would create chaos and mayhem not just in the United States and Great Britain, but in the vast areas of the rest of the world as well. This is concretely how hyperinflation could now very well arise: if one or more US creditor nations attempts to abruptly lighten up on dollars, the value of the US currency could undergo a catastrophic collapse, and that would spell runaway hyperinflation on the US domestic front. The numbers are a decade old but the concept is still there. That being said, given that the United States has used its status as a method of financing itself into maintained prosperity, the loss of that status would remove that privilege. Instead, the United States would be forced to either knuckle under to the dictates of the financiers that will have the country on its knees or do what it should have done all along – nationalize the Federal Reserve and begin issuing credit stimulus and imposing across-the-board tariffs on imports. It would be nice to hope for the best and prepare for the worst but, as things appear today, we might want to start preparing much more than hoping. The US economic system, partially as a result of becoming an empire with all its requisite destabilizations and wars, mostly a result of Free Trade, and partially a result of private central banking among a host of other factors, has been sacrificed on the altar of globalism. Aggressive behavior on the financial, political, and military fronts has thus created a world seething with anger and hatred at the United States, who is now willing and able to begin weakening the dollar dominance in hopes for the creation of a new “multipolar” world out of the ashes of the old “American” one. There are no signs that anyone in the American government is either prepared to defend against the dollar collapse or to prevent it. In fact, all signs point to the possibility that such a collapse is desired by the Anglo-financier community. In other words, the best time to prepare is today.